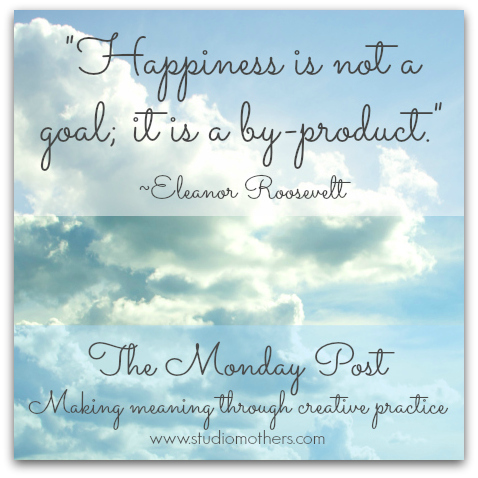 “The Monday Post” on the Studio Mothers: Life & Art blog is too wonderful to not share with all of you. If you haven’t already seen the website, take a minute, and be inspired! haven’t posted in a while. my one week refresh is becoming 3 weeks. I will be reviewing my progress this week, reading for pleasure, and figuring out what to do for NaNo this year. Awesome, Heather. NaNo is looming large…who hoo! Well, this practice is keeping me humble. This week, I desire to let it be an unexciting week where I have plenty of time to work. 1. Do my morning practice that includes meditation, yoga, a poem or two and morning pages. 2. Green Smoothie every day. 3. Experiment with swishing my mouth with coconut oil as a healing for my gums. 4. Write 1000 words for six of the seven days this week. 5. Post at least one blog post on Laundry Line Divine. 6. Answer the prompt I get from the Avocado Sisterhood. Did it already. 7. Promote our FeMail mail art workshop. 8. Prepare for the Powder Keg Sessions writing workshop on the 29th. 9. Secure a start date for the free version of the Powder Keg. 10. Work in the garden at least once. 11. Go to yoga and Zumba, at least 3 times. Went to yoga today already. 12. Make one batch of plum jam with Mary. 13. Let the week work it’s magic on me. Many other small things, but these are the ribs of my intention. My life is so heavily dominated by editorial client work right now that I’m having trouble seeing anything else. My strategy for this week is to work like a maniac, keep an eye on some health issues, and read as much as I can. last week’s goals: finish read through (in 3, 2, 1…) things still amped in life, kid # 2 has a stubborn staph infection and a couple of other things going on, so we’ve been doing a caretaker/doctor/specialist dance. key word this week: SIMPLIFY. finish read, finish edits, hope for artwork sometime next week, plug away at the fundraiser/self-pub thing. Anything else that happens: collaboration, or writing in the other longer work i will call a bonus. CHECK simplify. wrote a few times, could not focus on finishing edits. going to do that now. down time was precious last week, i gave myself a mental break within my day to day. this week’s goals: today: finish felix hand edits in copy. begin transposition into digital version manuscript edits. keep up daily writing and creativity in other areas, declutter. going to go with the flow and not force, waiting on art.